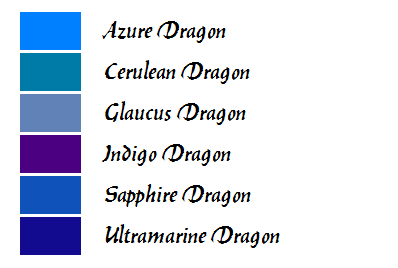 Here are six cousins to the venerable blue dragon. Azure Dragon: An azure dragon’s sense of self-worth is as majestic as the color of its scales. Azure dragons are mesa dwellers – haughty and self-satisfied. They control the weather over their domains, alternately keeping it dry as dust to discourage large interlopers from approaching and then, when fools dare tread on their domain, causing downpours that turn into flash floods. 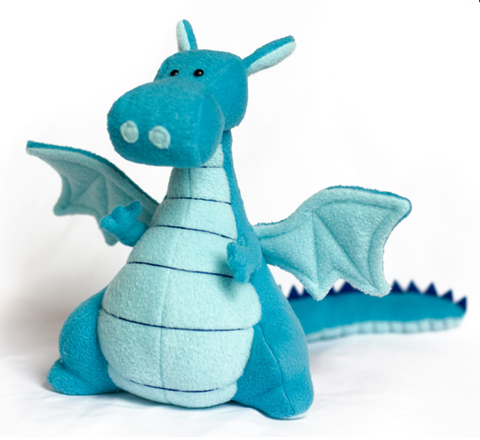 Azure dragons are medium-sized for blue dragons, with lofty, white horns that curl and nearly meet above its head. Azure dragons are always capable of speech (usually a throaty, superior baritone) and magic. They can always use the following spells: Control weather (at will), call lightning (at will) and lightning bolt (3/day). | Azure Dragon: HD 9; AC 2 ; Atk 2 claws (1d6), 1 bite (3d8); Move 9 (F24); Save 6; CL/XP 11/1700; Special: Spells, control weather, call lightning and lightning bolt. Cerulean Dragon: Cerulean dragons are small for blue dragons, with tiny scales and over-sized wings. They are gregarious and vivacious, and the least wicked of the blue dragons, though they are as self-centered as any other wyrm, and prefer to be the center of attention. Electricity runs up and down their scales (touching them inflicts 1d4 points of damage) and their bodies give off an electric hum. They are capable of controlling electro-magnetic forces around their body (treat as double-strength telekinesis that only works on iron-based objects). Most cerulean dragons keep dozens of steel blades around their lairs, whipping them into a blade barrier when intruders approach. The blade barrier has a radius of 20 feet and inflicts 8d6 points of damage to anyone who passes through the barrier. They have the normal chances for speech and magic use. | Cerulean Dragon: HD 8; AC 2 ; Atk 2 claws (1d6), 1 bite (3d6); Move 9 (F24); Save 7; CL/XP 11/1700; Special: Magnetism, blade barrier. Glaucus Dragon: Small, wiry and suspicious, the glaucus dragon likes to toy with its prey. It always acts as though it is incapable of speech and magic use, and always pretends to be sleeping when first encountered. The beast breathes a heady, thick gas – as thick as pea soup – that forces those who breathe it in to pass a saving throw or be struck by the slow spell and age 1d10 years per round. The cloud covers an area measuring 20-feet in radius. This aging can be reversed with a potion consisting of the offending dragon’s blood mixed with blueberries and stirred with electrified copper. They have the normal chance for a blue dragon to speak and use magic. | Glaucus Dragon: HD 8; AC 1 ; Atk 2 claws (1d6), 1 bite (3d6); Move 12 (F27); Save 8; CL/XP 11/1700; Special: Breath weapon (aging). Indigo Dragon: Indigo dragons are large and lazy – almost floppy if that’s possible for a dragon. They have small, useless wings on their shoulders and terrific maws filled with sharp teeth and two elephantine tusks that jut out of their mouths. Indigo dragon are gluttonous and boorish. They have only a 45% chance to speak, and when they can speak they rarely have anything interesting to say. Indigo dragons radiate an aura of static electricity down the spines on their back. This electricity arcs to any creature within 10 feet, inflicting 2d6 damage per round on characters without metal armor and an additional 1d6 damage for characters in metal armor and/or wielding a metal weapon (i.e. 4d6 total for a character in metal armor wielding a metal weapon. Indigo dragons are encountered in their lairs 80% of the time and are asleep about 70% of the time. | Indigo Dragon: HD 10; AC 2 ; Atk 2 claws (1d6), 1 bite (4d6); Move 6; Save 5; CL/XP 12/2000; Special: Electric aura. Sapphire Dragon: Sapphire Dragons have brilliant, polished scales that look like little teardrop shaped sapphires. They live deep underground and are notoriously fastidious and picky about their surroundings. All sapphire dragons can assume human shape as they wish, usually taking the form of tall, stately men or women with blue-black hair and sapphire blue eyes. They enjoy attention and worship, and often cultivate little cults of beautiful men and women. Sapphire dragons can always communicate telepathically and cast spells, though they sometimes are incapable of physical speech. A sapphire dragon with spell-casting ability always has the following spells: First Level – Sleep; Second – Level: ESP; Third Level: Suggestion; Fourth Level – Confusion; Fifth Level: Feeblemind. Their breath is a sapphire ray that can be directed at a single victim. The ray causes all of the victim’s synapses to fire, stunning them for one round and leaving them with a pounding headache for the next 24 hours. While suffering from the headache, spellcasters have a 5% chance of their spells failing to materialize. | Sapphire Dragon: HD 9; AC 2 ; Atk 2 claws (1d6), 1 bite (3d8); Move 9 (F18); Save 7; CL/XP 13/2300; Special: Breath weapon (stun), spells, telepathy 100 feet. Ultramarine Dragon: Ultramarine dragons are large, powerful specimens of dragonhood, with deep blue scales that gleam in the light and absolutely blaze in the moonlight. They have large, knowing eyes and long, overlapping fangs. Ultramarine dragons are imperious and overbearing, and are especially vulnerable to flattery. They are also uncommonly fond of intoxicating beverages, and have been known to keep especially skilled bartenders in their lairs mixing wondrous concoctions. An ultramarine dragon spits chain lightning. Chain lightning strikes one target initially, then arcs to up to ten other targets who cannot be more than 10 feet apart from one another. Damage is normal on the first target and half normal on all others. Saving throws to halve damage are permitted. If multiple targets fail this saving throw, their minds are switched by the mystic lightning. | Ultramarine Dragon: HD 10; AC 2; Atk 2 claws (1d6), 1 bite (3d8); Move 9 (Fly 24); Save 5; CL/XP 13/2300; Special: Chain lightning (damage and mind-switching). Image found at the Lost Papers of Tsojcanth. And the details on the sapphire dragon are great too. Dang! Thanks! These dragon variants are so cool I want to borrow them for my own campaign. Are you ok if I mention them in my own blog? Cool, but if we get get to teal, terra cotta, or persimmon dragons, I'm gonna have to draw the line. Trey – I'm saving those colors for my alternate take on manticores. John L – Sure, as long as you don't duplicate the stats.